The Australian Centre for Christianity and Culture at Charles Sturt University has shown its support to members of the Muslim community in the wake of the Christchurch terrorist attack. On Saturday night Anglican Bishop Philip Huggins who is the President of the National Council of Churches Australia and Director of the Centre for Ecumenical Studies at the ACC&C attended a vigil in Melbourne. “Our hearts break when people go to say their prayers and are attacked by terrorists,” he said. “I wanted to be here to say a prayer from my tradition and to give the best support I possibly can to my dear Muslim brothers and sisters as they grieve. “I want to pray for those who’ve died, I want to pray for those bereaved, I want to pray for those injured – and that’s today. Above photo caption: left to right: Mr. Wan Kandleholder, Former President of the Islamic Council of Victoria, Bishop Philip Huggins, Sheikh Ilyas Ozkan, Imam of the Sunshine Mosque and Sheikh Ramazan Otkun, President of the Islamic Community Milli Gorus. On Sunday 17 March 2019, the Executive Director of the ACC&C Rt Rev'd Professor Stephen Pickard (left) together with Rev Alistair Christie (second from right), President ACT Churches' Council and Bishop Pat Power (middle), Auxiliary Bishop Emeritus of Canberra and Goulburn met Dr Abdul Hakim (second from left), President of the Islamic Society of ACT to show their support and concern for the Muslim community. Rev Alistair Christie said they were warmly welcomed at the Yarralumla mosque and an 8-year-old boy came up to thank them for their support. On Monday Rev Tim Costello who is Executive Director of Micah Australia and an Ambassador for the Australian Centre for Christianity and Culture released a video on Facebook in response to comments made by Senator Fraser Anning. 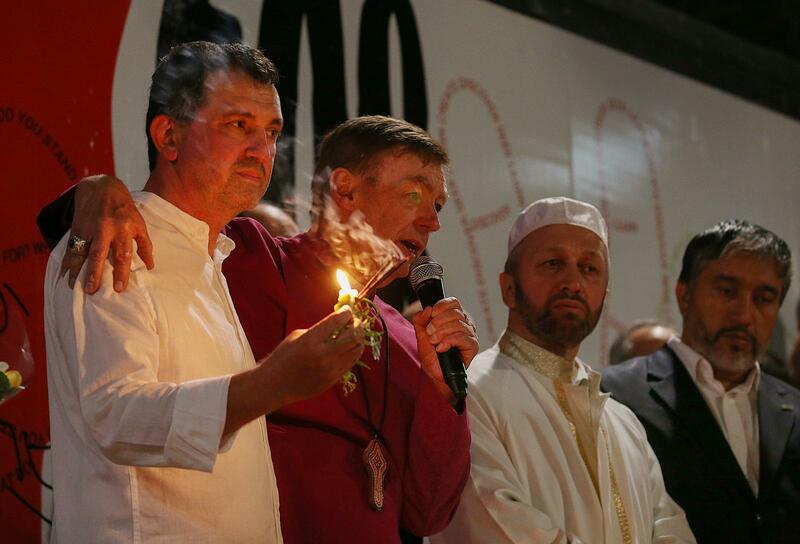 On Monday night Bishop Stephen also attended a vigil at the Canberra Islamic Centre as reported by The Canberra Times. Bishop Stephen read out the ACT Churches’ Council statement on behalf of the President of the ACT Churches’ Council Rev Alistair Christie. To people of the Muslim Faith in Canberra. As we recoil from the horror of the massacre of people at prayer in two mosques in Christchurch last Friday, and the continuing media focus on the details of that day, we want to assure you of our love and prayers for you, our dear friends, together, all children of a compassionate, merciful and loving God. We grieve with you in the loss of lives, people of all ages; for their loved ones, families broken apart, their unfulfilled hopes and the tears that flow. May they know God’s peace and presence in the days ahead as they seek to rebuild their lives and find solace in their life together. Not only for these days, but for the future of our nation, as representatives of the churches of the ACT, we pledge ourselves to work together with all, whatever our faith, culture or race, to grow a nation free of prejudice and fear; a people that refuses to be divided; a nation that cares for others even as we care for ourselves. Top photo: On Monday 18 March 2019 Bishop Pickard attended a vigil and prayer meeting at the Canberra Islamic Centre for victims. 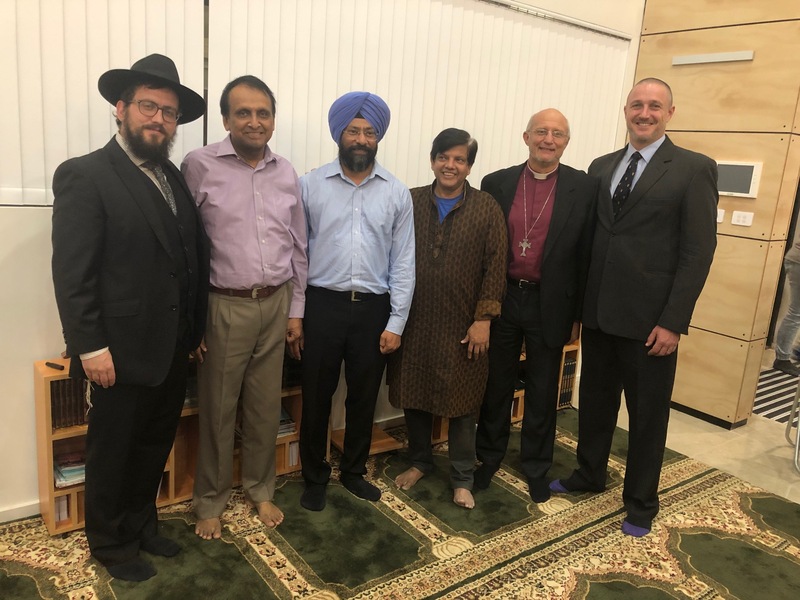 Left to Right: Rabbi Shmueli Feldman, Dean Sahu Khan, Amardeep Singh, community person, Stephen Pickard, David Leibowitz. 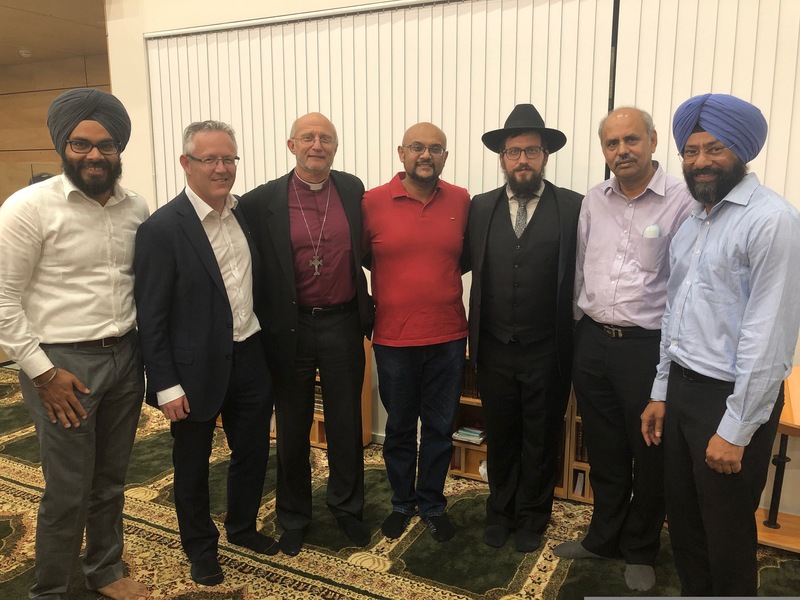 Caption: Balinder Singh, Senator David Smith, Professor Stephen Pickard, a member of the mosque, Rabbi Shmueli Feldman, Prakash Maheta and Amardeep Singh.